Protectaflex | Dual Containment Hose System | Chemical Dosing Hose | Colex International Ltd.
Protectaflex is the next generation dual containment hose system, offering all the benefits of existing products but in a smaller, lighter, and more manageable format. Due to its lighter weight & reduced packaging, Protectaflex offers a significant reduction in shipping weight, lowering your carbon footprint. The durable PU outer is UV stable and offers excellent clarity for visual inspection. We can also offer Reinforced PVC, Hytrel Lined VendHose & PTFE as inner hoses. Please contact our authorised distributor FT Pipelines for supply details and additional line items, catchpots, trace heating, insulation, fittings and istallation training. 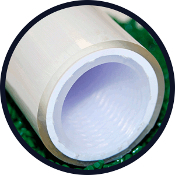 Natural Polyurethane outer tube, clear reinforced PVC inner hose. Click here to view the Reinforced PVC technical data. "Colex Protectaflex Dual Contained Hose WO/NO"
Technical information for use as a guide only. All colours & lengths are subject to stock. Pressure values given are based on the short term burst pressure at 20°C . Any increase in temperature above 20°C will result in a decline in working pressure values. Natural Polyurethane outer tube, Grey or White vendhose inner hose. Click here to view the VendHose technical data. * WRAS approved for the conveyance of water up to 23°C - Approval Number 1209524.